"Thomas of Woodstock" redirects here. For the play, see Thomas of Woodstock (play). Thomas of Woodstock, 1st Duke of Gloucester (7 January 1355 – 8 or 9 September 1397) was the fifth surviving son and youngest child of King Edward III of England and Philippa of Hainault. Thomas was born 7 January 1355 at Woodstock Palace in Oxfordshire after two short-lived brothers, one of whom had also been baptised Thomas. He married Eleanor de Bohun in 1374, was given Pleshey castle in Essex, and was appointed Constable of the Realm. The younger sister of Woodstock's wife, Mary de Bohun, was subsequently married to Henry of Bolingbroke, Earl of Derby, who later became King Henry IV of England. In 1377, at the age of 22, Woodstock was knighted and created Earl of Buckingham. On 22 June 1380 he became Earl of Essex in right of his wife. In 1385, he received the title Duke of Aumale, and at about the same time was created Duke of Gloucester. 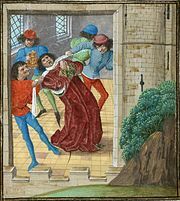 Murder of Thomas of Woodstock. 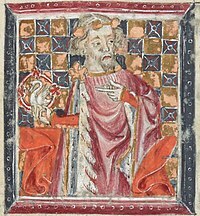 Thomas of Woodstock was in command of a large campaign in northern France that followed the War of the Breton Succession of 1343–64. The earlier conflict was marked by the efforts of John IV, Duke of Brittany to secure control of the Duchy of Brittany against his rival Charles of Blois. John was supported in this struggle by the armies of the kingdom of England, whereas Charles was supported by the kingdom of France. At the head of an English army, John prevailed after Charles was killed in battle in 1364, but the French continued to undermine his position, and he was later forced into exile in England. He returned to Brittany in 1379, supported by Breton barons who feared the annexation of Brittany by France. An English army was sent under Woodstock to support his position. Due to concerns about the safety of a longer shipping route to Brittany itself, the army was ferried instead to the English continental stronghold of Calais in July 1380. As Woodstock marched his 5,200 men east of Paris, they were confronted by the army of Philip the Bold, Duke of Burgundy, at Troyes, but the French had learned from the Battle of Crécy in 1346 and the Battle of Poitiers in 1356 not to offer a pitched battle to the English. Eventually, the two armies simply marched away. French defensive operations were then thrown into disarray by the death of King Charles V of France on 16 September 1380. Woodstock's chevauchée continued westwards largely unopposed, and in November 1380 he laid siege to Nantes and its vital bridge over the Loire towards Aquitaine. However, he found himself unable to form an effective stranglehold, and urgent plans were put in place for Sir Thomas Felton to bring 2,000 reinforcements from England. By January, though, it had become apparent that the duke of Brittany was reconciled to the new French king Charles VI, and with the alliance collapsing and dysentery ravaging his men, Woodstock abandoned the siege. 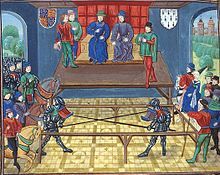 Thomas of Woodstock was the leader of the Lords Appellant, a group of powerful nobles whose ambition to wrest power from Thomas's nephew, King Richard II of England, culminated in a successful rebellion in 1388 that significantly weakened the king's power. 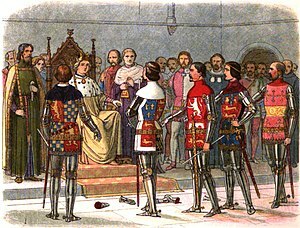 Richard II managed to dispose of the Lords Appellant in 1397, and Thomas was imprisoned in Calais to await trial for treason. During that time he was murdered, probably by a group of men led by Thomas de Mowbray, 1st Duke of Norfolk, and the knight Sir Nicholas Colfox, presumably on behalf of Richard II. This caused an outcry among the nobility of England that is considered by many to have added to Richard's unpopularity. Thomas was buried in Westminster Abbey, first in the Chapel of Saint Edmund and Saint Thomas in October 1397, and two years later reburied in the Chapel of Saint Edward the Confessor. His wife was buried next to him. As he was attainted as a traitor, his dukedom of Gloucester was forfeit. The title Earl of Buckingham was inherited by his son, who died in 1399 only two years after Thomas' own death. Thomas of Woodstock's eldest daughter, Anne, married into the powerful Stafford family, who were Earls of Stafford. Her son, Humphrey Stafford was created Duke of Buckingham in 1444 and also inherited part of the de Bohun estates. The other part of these estates—including the Earldom of Hereford, which had belonged to Mary de Bohun and had then become incorporated into the holdings of the House of Lancaster—became a matter of contention in the latter 15th century. Thomas of Woodstock's murder plays a prominent part in William Shakespeare's play Richard II, though he is dead at the time of the play's beginning. He also is the subject of Thomas of Woodstock, another Elizabethan drama by an anonymous playwright. Because of its stylistic affinities to Shakespeare's play, it is also called Richard the Second Part One. ^ a b c d e f Weir, Alison (1999). Britain's Royal Families: The Complete Genealogy. London: The Bodley Head. ^ a b c Anthony Goodman, The Loyal Conspiracy: The Lords Appellant under Richard II. University of Miami Press, 1971. p. 5. ^ Tuck, Anthony. "Thomas [Thomas of Woodstock], duke of Gloucester", Oxford Dictionary of National Biography, 3 January 2008. Retrieved 13 February 2019. ^ a b c Goodman, pp. 124–126. ^ Tuck, Anthony (September 2004). "Thomas, duke of Gloucester (1355-1397)". Oxford Dictionary of National Biography. Oxford University Press.